(Nanowerk News) In an important step toward creating a practical underwater glue, researchers at UC Santa Barbara have designed a synthetic material that combines the key functionalities of interfacial mussel foot proteins, creating a single, low-molecular-weight, one-component adhesive. Their findings appear in the journal Nature Communications ("High-performance mussel-inspired adhesives of reduced complexity"). "We have successfully mimicked the biological adhesive delivery mechanism in water with an unprecedented level of underwater adhesion," said UCSB research faculty member Kollbe Ahn, the article's lead author. An adhesive primer that can overcome the barrier of water and contaminant "biofilm" layers to adhere to virtually any mineral or metal oxide surface has a variety of applications, from basic repair of materials regularly exposed to salty water, to biomedical and dental uses, as well as nanofabrication. "More importantly, this less than 2 nanometer-thin layer can be used not only at the nano-length scale, but also in the macro-length scale to boost the performance of current bulk adhesives," Ahn added. Inspired by mussels' ability to cling to surfaces despite the constant pounding of waves and wind, the interdisciplinary group of scientists studied the combination of proteins mussels secrete in the form of byssus threads that extend from their feet and anchor them to rocks, pilings or any other surface in their vicinity. The work builds upon research conducted by UCSB professor J. Herbert Waite, who for three decades has investigated the adhesion strategies employed by mussels in the inhospitable rocky intertidal zone. 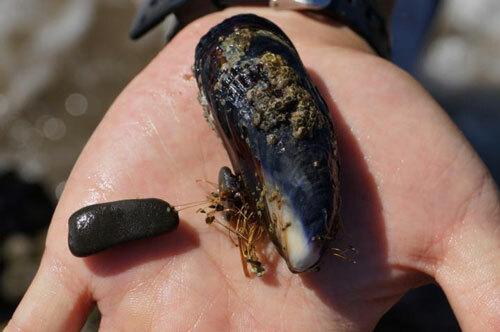 While wet adhesion is an adaptation that is widespread among inhabitants of the intertidal zone, he said, mussels in particular lend themselves to the kind of fundamental research necessary to understand how it is possible to stick to something wet or submerged. "They actually stockpile everything they use to stick to the surface in finite quantities that can be purified and characterized," said Waite. "That has to be done before you can copy it." But science had struggled to emulate the ability the molluscs have developed over hundreds of millions of years of evolution. According to Ahn, at least part of the reason for the difficulty has been the lack of a deep and fundamental understanding of the biological mechanism at the molecular level, leading to synthetic adhesives that have generally fallen short in the quality of adhesion and often required complex and somewhat impractical processing and functionalization. While collaborating with colleagues from the Technion-Israel Institute of Technology, the UCSB research team developed a less complex material that nevertheless demonstrates a record high wet (or underwater) adhesion -- up to 10 times the effectiveness previously demonstrated in other such materials. Key to this technology is the synthesis of a material that combines the key functional molecular groups of several residues found in the biological adhesion proteins. In mussel feet, the amino acid L-Dopa (also used in humans as a treatment for Parkinson's disease) contains hydrogen-bonding chemical groups called catechols. These are found in especially high quantities at the interface between the plaques at the ends of the byssus threads the mussels secrete, and the often wet and submerged surfaces to which they adhere. By mimicking the characteristics of mussel foot proteins that are particularly rich in this amino acid, Ahn and colleagues designed a molecule that can prime and fuse two surfaces underwater. To date, the researchers have studied the practical electronic and biomedical applications of this and other families of self-assembled monomolecular-layer catechols and have three patents pending. In addition, they launched NanoM Technologies, LLC to further develop this technology. Applications of this catecholic adhesive primer are diverse. It can be used to prime or stick surfaces that regularly come into contact with the elements, or added to materials to make them self-healing in wet situations. Additionally, said Ahn, the small molecules of this adhesive form atomically smooth, ultra-thin glue layers, which hold particular promise for the fabrication of nano-scale electronic devices, including circuits and battery components. The spontaneous coating process, he added, is based on molecular self-assembly in water, without the aid of toxic chemicals, volatile organic solvents or external energy inputs such as heat or light -- a sustainable and environmentally friendly process that satisfies the requirements of the emerging discipline of green chemistry. "This finding opens the door to a new generation of nanofabrications," he said.